Conor Walton, at Jorgensen Fine Art, is a young representational painter who bravely makes elaborate, and unfashionable, pictorial allegories, working from a basis in still life and figure composition, with copious referential dips into the alphabet soup of art history. 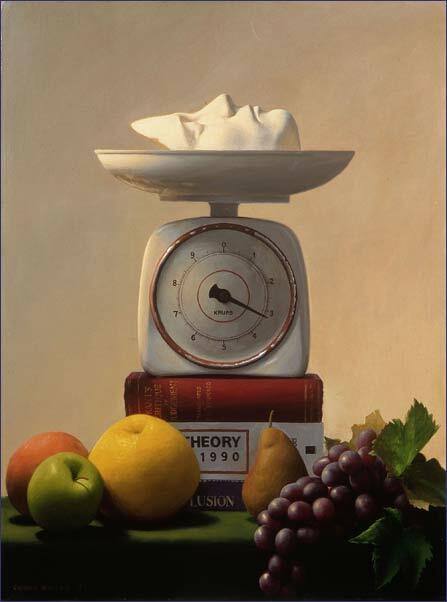 There is, oddly enough, a small but significant group of such painters active in Ireland, including James Hanley and Aidan McDermott, who have in common an adherence to a realist style and the laudable ambition to use it to address contemporary issues, rather than treating representational painting as effectively defunct, good only as a vehicle for ironic or sentimental pastiche. That said, Walton's work does tend towards the portentious, straining self-consciously for significance, and some of the figure compositions, including the undoubtedly ambitious Then We upon our Globe's Last Verge shall Go, which depicts numerous people looking heavenwards, recalls the bland, earnest tone of illustrations in propagandist religious publications. Nevertheless, he is a technically capable painter and a resourceful picture-maker, particularly in his employment of unusual viewpoints. In many of his compositions he favours dark, claustrophobic spaces raked by directional artificial light. There are probably too many symbol-laden still-lifes in which the rendering of fruit and glass and fabric (of the "just look at the bloom on those plums!" school) isn't quite as sharp as, so to speak, it seems to think it is. But on the whole Walton emerges as an interesting and promising artist.